What’s the Difference: Learning Designer vs. Instructional Designer? 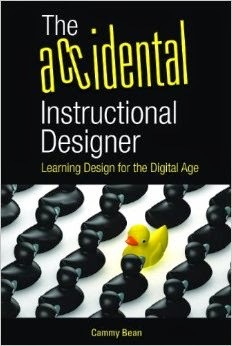 In my last job, I was the Manager of Instructional Design. Now I’m the VP of Learning Design. Did I make the leap because I work for the UK mothership – and that’s what they call it across the pond? Are we – as in the collective we of the eLearning ‘industry’ – making a conscious shift away from Instructional Designer since no one on the outside knows what that means? Is Learning Designer more descriptive? Is it more all encompassing? Am I now thinking about learning solutions – all the myriad ways to help someone actually learn – not just how to feed someone up with a little instructional tidbit? Is this a general trend or just me? Brent Schlenker: Marketers and Game Developers Know More About Learning Than We Do! Live session with Brent Schlenker: Marketers and Game Developers Know More About Learning Than We Do! hosted by Training Magazine Network. Disclaimers: “I am not a marketer or a game developer.” (Although he plays a LOT of games). When he listens to game developers talk, feels like they’re in the learning prof.
What I am: 15+ yr learning professional, lifelong learner, player, consumer. news – using media to tell stories. 10 years at Intel working in tools. How do we use new and emerging technologies in the learning space? We don’t typically create the new tools in eLearning – that innovation is happening in other places – e.g., marketing. What’s coming down the pike so we can prepare our learners for them? Point of today’s conversation: talking training, design and development if a marketing person were doing it. Or a game developer. What cool things are other areas doing that we can leverage to make us better designers and developers? Marketers are REALLY good at understanding who their target audience is. When working with a Subject Matter Expert (SME), they have a tendency to put everything into the training. New technology gives us new tools. Marketing dept always has the money. That’s where most creative talent in organizations go. This is where business finds the value, which is why marketing is where the dollars go. They also get the resources to analyze the data. What are they doing that’s different? How do they measure success? Are the expectations on marketing depts greater than on training? Marketing brings in the money. Learners need to change behavior…which is what marketing does. Marketing talks about a CAMPAIGN. Learning talks about a curriculum. A campaign is a series of events/operations/continuing storyline – not just a “set of courses”. Design and develop learning campaigns that involve storylines, adventure, social media, people – every campaign has a structure to it – there is a formal development/design process. But there’s room to move. Different media involved in an ad campaign. Let people engage with others in the learning process. New tools make this easier to implement from cost perspective, but still a big time cost to developing/designing learning campaigns. A learning campaign is different than a marketing campaign. It’s not about t-shirts and email blasts – it’s about providing more ways for learners to engage with and access content. Each person’s individual desire to learn something is what makes for engagement. We’re not talking about “dressing up” content to fake that it’s engaging. A Theory of Fun (“games are puzzles to solve, just like everything else we encounter in life”) The most serious issues we have to approach are puzzles. Don’t just read learning design and pedagogy books. Extend what you can do – think outside of your field. Great at explaining. Now companies are coming to them to do marketing – to explain their products. Why are these so memorable? What can we learn from these infomericals? What are they doing – how do they display information and what' they’re teaching us about their product? Seems like an ID at work in there. YouTube – videos – short hits to educate. 30-90 seconds. A whole lot of info, but the right info when you need it. Production costs have dropped – we can start adding a lot more media/engagement to our programs. Attention – ways marketers and game developers get our attention. They do this well. Analysis – really know their audience. Don’t just need IDs on your staff – get some creatives in there who look at things a bit differently. Understand gaming theory and gaming design. Put the customer/consumer/learner first. We say we do…but we don’t often do it. As eLearning matures (let’s just agree that this is the case), are you finding any differences in the complexity of the types of eLearning you are creating? In my early days, I wrote a lot of software training courses. Instruct, Demo, Practice, Test, Rinse, Repeat. Something like that. CBT did the job. Is it just me and my particular career trajectory and things seem to be getting deeper now? Or has this complexity been there all along and I was just skating along in a parallel universe? Are the expectations for eLearning actually getting more demanding? Are we seeing a real shift from just information and declarative knowledge to real expertise development? I guess the obvious answer is yes. We must be. We have to be. Businesses are looking for eLearning to fill more of the training need. Universities and institutions are transitioning to online curriculum. So as designers, we – (and by this, I mean I) – need to be better prepared to create more complex training programs. The Learning process is often disconnected from the need and the performance. A High Performance Learning System has Need/Learning/Performance all cycling together. How can we add more to Learning to get to high performance? Informal learning is never intentional. Formal learning is intentional. [I disagree with this! I use my blog/twitter with intention. Lance asks: What happens if you add intentionality to an informal activity? It moves it on the contiuum. It’s not black and white. It’s not informal vs. informal. The choice is not informal vs. formal. Intentionally Informal: reading a blog, twitter, etc. Informal unintentional: social media, search, conversations, play, life. Intentional Informal: reading and searching, coaching and mentoring, blogs, wikis, some, etc. This is the sweet spot. Taking tools and using them in a new way – add intentionality to them. These are all tools – it’s how you use them. Intention gives you metrics and measurement. Non-formal learning can have objectives. The opportunity is not formalizing informal learning, but rather working with non-formal learning. You will lose the battle if try to come up with metrics around totally informal learning. “Technology gives us more options.” (Kevin Kelly) We used to have two options: formal and informal. Now we’ve got all this middle ground. If there’s no design, it’s informal. What are the metrics? – think about them upfront, not at the end. (Amount of time to move info through a salesforce – maybe the metric is time). Approach? Given our problem, the metrics, the stakeholders – how are we gonna do it? What are milestones along the way? Test, learn, iterate (rapid prototyping and quick cycles) – “fast and ok is better than slow and good.” Today’s world is ready, fire, aim, ready, fire, reaim! Go right to Version 1 – forget the beta. No one’s committed to a beta. Action learning – nothing is certain. Integration – it’s got to fit inside a larger system. Pragmatism – leverage opportunities. look inside the org and decide where this will make a difference. Working from right to left – keep the end in mind – first figure out what problem you’re trying to solve. Don’t start with Twitter and then work backward. Layers of complexity (a classroom is actually pretty simple. But this will have many things you can’t control or plan for). And then…we ran out of time! Side two of his business card = Creative Abrasionist – hoping to be provocative. 30 years in the learning industry. People in the biz need to be open – it’s not either/or. Come November, I'll be heading to San Jose for DevLearn '09. Looking forward to the schmoozing, the DemoFest, the ID Zone, the Social Media Camp, the learning!, and -- oh yes! -- the speaking. 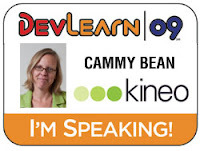 Check out full descriptions of our sessions as well as all the other cool things that are happening at the DevLearn website. Over on the Kineo website, we frequently post articles and tips on a variety of topics. Usually e-learning related, but you never know. Last week I put up a Back to School Reading List with an ID/e-learning focus. Be interested to hear what you've got on your reading list right now. What are you hoping to read this fall in order to expand your mind and your professional capabilities? Also check out Tip 27: Tear Down the Visual Wallpaper. (I did not write this one). Nice piece on graphics for instructional use. Come on -- admit it. You've used those same images, haven't you?